One of the city's grand Beaux-Arts structures, the St. Urban is an exuberantly designed apartment house of great distinction. Although it is very flamboyant and almost too robust in its assertive embellishments, it is one of the city's most spectacular residential properties. Its domed corner tower topped with a cupola is an important ingredient of the Central Park West skyline despite the building's relatively short height of 13 stories. Its curved mansard roof, moreover, is punctuated by very pronounced broken pediment dormer windows. The broken-pediment dormers alternate in size and are a surprisingly strong design statement, the equivalent of a major cornice. The building was designed by Robert T. Lyons for Peter Banner, the developer, and completed in 1906. Lyons fashioned an extremely complex and rich facade in the French Second Empire style for the St. Urban that is very ornate and rhythmic with large continuous balustrade belt courses atop the three-story, rusticated limestone base and near the top and many angled bay windows. The corner, which is surmounted by the domed tower, is rounded and the asymmetry of the composition is effective. The base of the building is marvelous with a very large, rectangular driveway that originally was the building's entrance. This no longer serves, however, as the building's entrance, unfortunately and is currently unused as a new entrance has been created just to the north of it with its own rather small and narrow marquee. Although the new entrance is a bit incongruous in juxtaposition with the very dramatic arched driveway, the alteration is not without its merits as the driveway now has very large floor-to-ceiling windows with handsome wrought-iron framing that open onto views of the extensive lobby, which has two separate elevator/stair banks, creating a nice feeling of openness. The building is somewhat similar to the larger Ansonia and Dorilton apartment houses on Broadway at 73rd and 70th Streets, respectively. 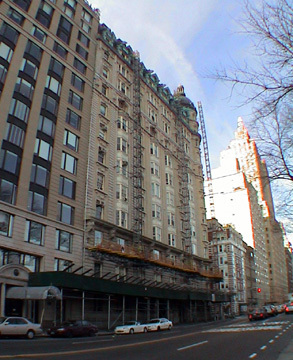 The Ansonia has a more delicate "touch," or "filigree," and the Dorilton is more decorative, but the St. Urban is perhaps the most impressive even if it is bulkier in appearance. The building, which has 56 apartments, was converted to a cooperative in 1966. In his excellent book, "Luxury Apartment Houses Of Manhattan, An Illustrated History," (Dover Publications, Inc., 1992), Andrew Alpern devotes an entire chapter to this fascinating building and its neighbor just to the south, a high-rise apartment building at 279 Central Park West that replaced the Italian-Renaissance-palazzo-style Progress Club that was subsequently converted into the Walden School. "The St. Urban," Alpern wrote, "has not been a stranger to notoriety and controversy....its stockholder-residents banded together in 1987 in an unsuccessful attempt to obtain official landmark status for the adjoining former Progress Club. Trying futilely to block the building's high-rise replacement tower, the residents were motivated at least in part by the potential loss of park views from their southern windows. They were ultimately rebuffed by New York's Landmarks Preservation Commission, which pointed to the 1958 removal of the club building's massive cornice and the addition of a fifth floor by the school." "A cornice," Alpern continued, "had figured in an earlier controversy. In 1905, even before the St. Urban was completed, attorneys for the Progress Club filed a lawsuit against Peter Banner arguing that the cornice at the top of the southern wall encroached upon their air space and caused rainwater to drip onto the northern portion of their roof garden, reducing its usefulness. During the construction of Banner's building there was a partial collapse of the structure. Although no one was killed, the incident caused the builder much grief and may have contributed to his ultimate loss of the building." Alpern reported that Banner hoped to rent apartments for $3,000 to $4,500 a year, but overextended himself and defaulted on his mortgage. "The building was brought at a foreclosure sale by a lawyer, Albert Forsch, for $1,130,000. Forsch, in turn, sold it in August 1906 to the Barstun Realty Company, which rented out the units," Alpern wrote. The Progress Club completed its handsome building designed by Louis Korn in 1904, but closed in 1931 and subsequently the building was acquired by the school, which altered and expanded the building. 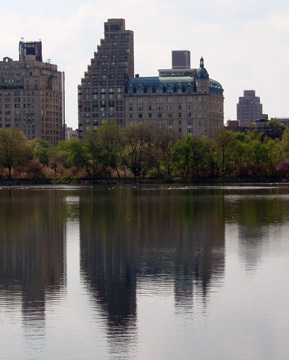 "Other than the 1884 Dakota and the Langham (which was then in construction on the blockfront from West 73rd to West 74th Streets), the only apartment houses on Central Park West [in 1904] were modest affairs. They contained units whose planning and decoration were far from ideal. Since apartment living was still associated in the public's mind with France (where it was far more acceptable than it was in provincial New York), and since things French were considered generally to be au courant and chic, Banner elected to have his new venture designed in the French mode. He evidently felt that there was an affluent local market for grandiose French flats - the same market that was renting or buying the row houses that were ubiquitous on the West Side. The traditional architectural elements of the French Second Empire were fair game at a time when high-rise apartment-house design was in its infancy and architects were willing to experiment in almost any style. Assembled and manipulated in a way advocated by the École des Beaux-Arts of Paris, these features were used by architect Lyons to create an overblown private mansion or hôtel particulier," Alpern wrote. According to Alpern, the architect was so pleased with his design for the St. Urban "that he replicated its facade - complete with mansard, corner tower and turreted dome, but on a much larger scale - for a proposed hotel that was planned in 1908 for Grand Army Plaza in Brooklyn, but was never built." The building's interiors were no less impressive than its exterior. "Each unit," Alpern noted, "has a 'public' section with a living room, a library, a dining room and a foyer, all connected en suite. In three of the four units on each floor, the living and dining rooms were identical in size, and were separated from each other by a library. The dining and living rooms sported bay windows, non-working fireplaces and spacious areas for entertaining. These suites were set at the front of each apartment, contrary to the more customary planning of the time, and they enjoyed sunlight and park views. In each unit there were also four good-sized master bedrooms, two baths, a kitchen, a pantry, two maids' rooms and a maids' bathroom. The basement had private storage rooms for the tenants, quarters for the superintendent and room for the heating, lighting, refrigeration and power-supply apparatus. Additional machinery was provided to filter all incoming water. The primary rooms and hallways of each unit were finished with parquet flooring, hardwood trim and specially designed hardware. The dining rooms featured quartered oak with paneled walls and beamed ceilings. The living rooms and libraries had mahogany details and the bedrooms were skirted with white enamel. The main bedroom in each apartment was fitted with a built-in wall safe, and the bathrooms and kitchens were furnished with the latest in fixtures and equipment. A tile-line refrigerator in each kitchen was connected to a refrigeration plant in the basement. This permitted each apartment to make its own ice, which was quite a novelty at that time." "The St. Urban is a splendid anachronism, an irreplaceable and elegant receptacle of large and gracious apartments. Its Beaux-Arts design is representative of many of the important structures of its time, and it serves to mark much of what was best about the days before World War I. The much-published architecture critic Ada Louise Huxtable grew up in the St. Urban," Alpern concluded, and argued that it was "light years away from today's architecture con-game" of "luxury" apartment buildings. The building abounds in interesting details. The driveway, for example, has a free-standing column very close behind one of its arch's "legs" and it has many "globe" lanterns, in two different sizes, along its Central Park West frontage. Christopher Gray, the architectural historian, devotes a chapter to the St. Urban in his excellent book, "New York Streetscapes, Tales of Manhattan's Significant Buildings and Landmarks," Harry N. Abrams Inc., 2003. He notes that Banner, a wool and animal hides dealer, lost the building in bankruptcy the year it was completed and describes it as one of the "big, blowsy buildings like the Dorilton at 71st and Broadway of 1902 and the Ansonia at 73rd and Broadway of 1904" thta were part of "the early generation of tall New York apartments." "Most unusual, to later eyes," Mr. Gray continued, "is the great variety of original windows: in-swing, out-swing, double-hung, French, transom, and other types." The interiors were altered over the years and the exterior did not survived untouched: "finials, cresting, roofwork, the slate roof, and balconies gradually disappeared," Mr. Gray noted, adding that "In 1989, the roof was redone after Landmarks Commission review, but they assumed the original roof was copper - and that's the way it was restored." Despite such changes, the building still evokes Parisian grandeur, but its heft displays a definite New York City eccentricity and a powerful personality. The building has no garage and no health club and has inconsistent fenestration and permits protruding air-conditioners. It is across the street from the Dwight School.